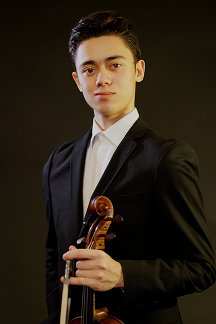 Violist Sean Juhl,18, is a senior at Hunter College High School (HCHS). He has performed solo viola/violin, chamber music and orchestra concerts in venues such as Alice Tully Hall, Merkin Concert Hall, Weill Recital Hall, and Carnegie Hall. As a principal viola, Sean Juhl participated in the National Youth Orchestra (NYO) - USA 2017. Under the batons of conductors Marin Alsop, Christoph Eschenbach and Valery Gergiev, Sean Juhl performed concerts in the cities of Amsterdam, Bogota, Copenhagen, Guadalajara, Montpellier, New York, Philadelphia, Prague and Quito during NYO-USA 2016 and 2017 seasons. He was a member of the New York Youth Symphony, Face the Music and Kinhaven Symphony Orchestra. As a concertmaster and later a principal violist, he led orchestras at HCHS for several seasons under the direction of Michael Stratechuk. Sean Juhl's chamber music experience includes performances with Hunter Piano Quintet and Piano Trio at the Young Musicians Concerts at the Chamber Music Society of Lincoln Center, the Werther Quartet at Weill Recital Hall, and the Vox Quartet at the Fishoff National Chamber Music Competition. At four, Sean Juhl began violin studies with his mother. He entered the Special Music School of America at five, studying with Victor Basis. His other teachers include Toby Appel, Joey Corpus and Bela Horvath. Currently, he studies with Carol Rodland at the Juilliard School Pre-College Division. He will participate the Perlman Music Program in 2018. Sean was accepted to The Juilliard School, class of 2022. His other passions are reading, skateboarding and video gaming. Sean Juhl speaks Mandarin fluently.